Tradition tells us that St. Apollinaris, who lived in the first and second centuries, was born in what was then Antioch in today's country of Turkey. He was made Bishop of Ravenna in Italy by St. Peter himself and was known as a great preacher and evangelizer of people. But like many Christians of his era, his faith made him the target of persecution. He was beaten, tortured, and driven from Ravenna several times, but kept returning, often in secret, to continue spreading the Good News of Jesus. 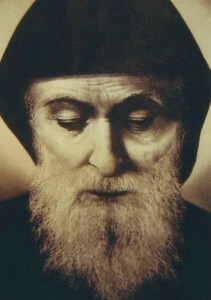 He was said to have worked many miracles, and today his name is invoked against the condition of epilepsy. 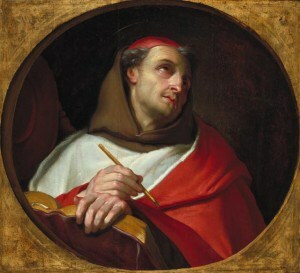 Artwork often depicts him performing miraculous acts. 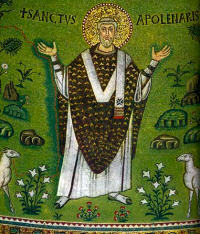 He is buried in the Basilica of St. Apollinaris in Ravenna.